What is included in the Barceló all inclusive? · Breakfast, lunch and dinner in the buffet restaurants of the Barceló Maya Beach and Barceló Maya Caribe hotels. · Dinner in the speciality restaurants: The Don Quijote Spanish Restaurant and México Lindo (Mexican). · Lunch and fast food on the beach (sandwiches, hamburgers, hot dogs, etc.) in the Capitan Morgan and Rancho Grande restaurants. · Snacks, meals and drinks available 24 hours a day in the Lobby Bar of the Barceló Maya Beach hotel. Alcoholic drinks are served exclusively to the over 18's. Located right on the most beautiful beach in the Riviera Maya and forming part of the spectacular Barceló Maya Beach Resort, Barceló Maya Caribe boasts unique architecture and a Mayan-inspired interior design. 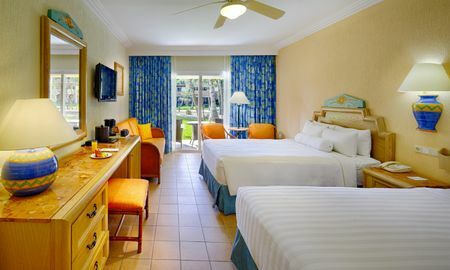 Renovated in 2014, Barceló Maya Caribe offers charming, spacious rooms with an abundance of natural light and comfort, promising an exceptional holiday experience. Barceló Maya Caribe has three dining options: Caribe Buffet, Don Quijote Spanish restaurant and Captain Morgan beach restaurant complete with Caribbean sea view. Guests can take full advantage of the all-inclusive Barceló Maya concept by enjoying snacks, meals and drinks around the clock at the buffet restaurants, bars, pools and beaches at Barceló Maya Beach. Barceló Maya Caribe boasts multiple swimming pools, a fitness room, retail outlet and U-Spa. U-Kids Spa and the mini-club are perfect for keeping the little ones entertained and active guests can experience a wide variety of exciting activities, including tennis, paddle tennis, basketball, diving, kayaking and windsurfing. The hotel is surrounded by luscious tropical gardens which can be explored along the excellent network of paths and trails ideal for a jog or long walk. Evenings and nights are the ideal time to enjoy a show at Theatre Kukulcan and a dance at the Jaguar nightclub. Barceló Maya Caribe is a spectacular resort just 75 kilometres south of Cancun International Airport, 20 kilometres south of Playa del Carmen and 35 kilometres north of the Tulum archaeological site and nature reserve.